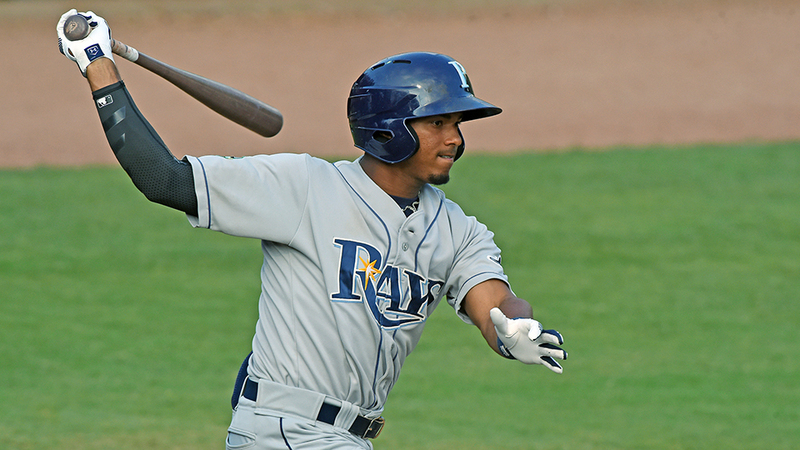 Taking stock of what made the farm system a grand success in 2018, Tampa Bay Rays director of Minor League operations Mitch Lukevics couldn't pinpoint just one reason. To him, this was a true team effort that extended to every, player, coach, manager and scout across every level. They all bought in, and it led to a dominant year across the Minors. "It's total organization success for the type of year we had," Lukevics said. "You have to get the right player, whether that be through the amateur Draft, which is [director of amateur scouting] Rob Metzler, or international signings, which is [director of international scouting] Carlos Rodriguez, or the trades we make from the pro scouting staff led by [director of pro scouting] Kevin Ibach. "It starts with the type of caliber of player -- the skill and the character of the player. These guys come over to player development, and we have some wonderful teachers here that are selfless." From top to bottom, it was a year to remember for the Rays, who finished with the Minors' top winning percentage at .604, five domestic playoff teams and two title winners (Triple-A Durham and Class A Bowling Green). All of those factors helped them edge out prospect-rich teams like the Padres, Braves and White Sox to claim a MiLBY Award as the staff choice for this year's Best Farm System. Even after former top prospects Willy Adames and Jake Bauers graduated to the Majors in the middle of season and current No. 3 prospect Brent Honeywell was lost for the year due to Tommy John surgery, Durham finished 79-60 in the International League's regular season. In his second stint at the Triple-A level, Kean Wong hit his stride and batted a solid .282/.345/.406 in 116 games, providing the backbone of an offense that finished second on the circuit with a .741 OPS. A deadline deal that shipped Chris Archer to the Pirates brought Austin Meadows to the Bulls, and he hit .334 with 10 homers and a 1.167 OPS in 27 games down the stretch to help them lock up their second consecutive Governors' Cup and Triple-A National Championship Game appearance. While the addition of Meadows was clearly beneficial to the club, some roster turnover presented challenges. And Lukevics couldn't have been more impressed with the way Durham aced every one of them. A good chunk of the team's projected Opening Day starting rotation never threw a pitch in a Bulls uni this year, and even so, the club finished with the league's best WHIP (1.23) and third in ERA (3.54). "Over half of our bullpen in Durham was in the Major Leagues," Lukevics pointed out. "[Along with position players Adames and Bauers], Andrew Velazquez was in the big leagues at the end of the year. And Nick Ciuffo was there, too. And that's just to name four guys that didn't play in that championship game. Would you have liked to have won the Triple-A National Championship Game? Sure. But our goal is to develop Major League championship-caliber players." And that goal was evident at all levels. Bowling Green led the Minors with 90 wins during the regular season, winning both halves in the Midwest League Eastern Division. But the Hot Rods entered the postseason with just one playoff victory since 2009, when they became a Tampa Bay affiliate. With the help of No. 12 prospect Vidal Brujan, who finished second on the circuit with a .313 average, they changed their fortunes and won it all. Those two titles headlined the organization, and other teams were superb but fell just short of a title. Double-A Montgomery scored the most runs in the Southern League (699) and clinched the first half in the North Division. Class A Advanced Charlotte went 40-29 during the second half to tie for first, but missed the Florida State League playoffs on a tiebreaker. Class A Short Season Hudson Valley reached the New York-Penn League Finals and fell two games shy of winning the whole thing. Rookie-level Princeton finished with the Appalachian League's best mark at 44-22, and the Gulf Coast League club ended half a game out of the postseason. Considering all that team success, it comes as no surprise that Tampa Bay saw plenty of noteworthy efforts from top prospects. Brendan McKay, who started his season with those championship-winning Hot Rods, fits into that category. Taken fourth overall in the 2017 Draft, the two-way player posted a 2.41 ERA and 0.88 WHIP over 19 outings (17 starts) on the mound while fanning 103 batters in 78 1/3 innings and holding opponents to a .196 average. McKay also took 192 at-bats as a position player or DH this season. His .214 average might not pop out on any leaderboard, but he still put up a strong .727 OPS. "It's about quality over quantity in everything on both sides," Charlotte hitting coach Joe Szekely said of McKay in July. "He does a good job of that and a good job of monitoring himself. He doesn't take too many swings and he comes in and has got a plan." McKay's development has been one of the most unique in all of baseball, and the Rays are pleased with the progress he's made in short order. "Brendan's a very good player and has the right demeanor," Lukevics said. "I mean, he is as solid as a rock. He's a good worker, good player and has a good temperament to handle the stresses of the game. It's not easy doing both, and certainly his pitching is ahead of his hitting. We'll see that down in the future, how it all maps out. But Brendan McKay has it and he's going to be a very good big league player some day." The Rays used their 2018 first-round pick on a more traditional pitcher, left-hander Matthew Liberatore. In the GCL and Appalachian League, the 18-year-old sported a 1.38 ERA in his first 32 2/3 pro innings. Tampa Bay's relievers produced plenty of bright spots, too, with the headliner being Colin Poche, winner of the Top Reliever MiLBY. Sent to the Rays from the Diamondbacks on May 1, Poche was lights out in his new system. After allowing one hit in five innings with the Biscuits, he moved up to Triple-A and held a 1.08 ERA and 0.92 WHIP in 50 innings with the Bulls. There was also plenty to smile about on the offensive side, and it all started at the top (or bottom, depending on how you look at it). No. 1 prospect Wander Franco, at 17 years old, made his stateside debut and was never overmatched. In fact, by season's end, he was wearing down the Appalachian League. He produced a .351/.418/.587 slash line with 11 homers, 28 total extra-base hits and 57 RBIs in 61 games with Princeton. "He has the gift and he's a good player, but what's impressive was at his age that he handled the Appalachian League mentally," Lukevics said. "If he had an 0-fer, he was coming right back at it and he's hacking. The game doesn't get him down, and that's quite remarkable for a young player. And he swings at balls in the strike zone, which is remarkable for a young player. Wonderful Wander Franco had a great year and he's going to be challenged next year." Although Franco was stationary in the Appy League, No. 13 prospect Nathaniel Lowe was on the move for what seemed like all of 2018. In a campaign that he began in the Florida State League, Lowe worked his way up to the International League by the end of the year. And wherever he was, he delivered with the stick. His 27 home runs topped the organization, and he mashed his way to a .330 average and .985 OPS in his second full season out of Mississippi State. "I want to put up power numbers at this level," Lowe said in August after his Triple-A debut. "I'm going to hit singles and see the ball well and work counts, but knowing that I can drive the ball off the best Minor League pitchers will be a big confidence boost heading toward the offseason and into Spring Training." In the middle of his breakthrough campaign, Lowe earned himself a spot on Team USA at the Futures Game, where he delivered an RBI single in the first inning against top Athletics prospect Jesus Luzardo. "How about Nate? [Class A Advanced], Double-A, Triple-A and he impacted a baseball at every level," Lukevics said. "This is a self-made player. This young guy took it upon himself ... and from day one in Spring Training came in and impacted a baseball. He impacted it all the way to Triple-A, and good for him and all of his hard work. He comes from a wonderful family, he and his brother [Josh Lowe]. They have wonderful intangibles." As Lukevics looks toward Spring Training and as the big league club follows up a 90-win season in the competitive AL East, the director of Minor League operations said he would be remiss if he didn't recognize the behind-the-scenes personnel that made this year possible. "If amateur, international and pro scouting don't bring us the caliber of players we have, we're not winning," he said. "If you get the right, raw resource from our scouting departments -- plural -- you've got a chance. And they did and we're very appreciative of it." Thanks in part to former heralded prospects Ronald Acuna Jr. and Ozzie Albies, the Braves took a huge leap at the big league level and won the NL East for the first time since 2013. Despite graduating such elite talent and finishing with a .457 winning percentage across the Minors, Atlanta still boasts 10 players among MLB.com's Top 100 Prospects and looks primed for sustained success through the coming years. After mixed results in 2017, Touki Toussaint led the organization in strikeouts (163) with Double-A Mississippi and Triple-A Gwinnett. His year earned him not only a Futures Game nod but also a MiLBY nomination for Top Starting Pitcher. As demonstrated byToussaint, Ian Anderson, Kyle Wright and Mike Soroka, the Braves have the pitching to compete for a long time. "I think they're constantly reassuring themselves that they can do it, so there's less and less doubt when that time comes about," Atlanta director of player development Dom Chiti told MiLB.com, speaking about the organization's pitching phenoms. "They're playing amongst their peers, and then they play in things like the Futures Game and stuff like that and they're constantly reassuring themselves that they can do it. I think that's a big part of it." With offensive pieces like Austin Riley, who bashed 19 homers despite missing some time on the disabled list, the Braves figure to generate plenty of run support for a long time, too.